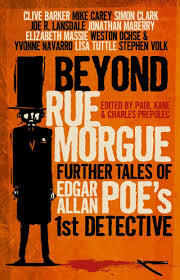 Beyond Rue Morgue: Further Tales of Edgar Allen Poe’s 1st Detective is a fascinating collection of short stories from various authors paying homage to the first detective in literature. Before Sherlock Holmes deduced his way onto the page, Edgar Allen Poe created a cool, analytical mind that found solving murders to be the height of fun. Chevalier C. Auguste Dupin was detecting before the word “detective” was even coined. He has a similar mind to Holmes, to the point that you have to wonder if Doyle was a Poe fan. Beyond Rue Morgue starts, appropriately enough, with the story that started it all, Poe’s “The Murders in the Rue Morgue.” Kicking things off with the original is great in case you haven’t read it before, or if it’s been a while and you need a refresher. It’s followed by new stories by several authors and concludes with “New Murders in the Rue Morgue” by Clive Barker, first published in the 1980s. Some of the stories explore further adventures of Dupin, others follow his descendants and their exploits. Many of the stories play around with history, taking real, or sometimes legendary, events and tying them to Dupin or one of his descendants. They all have different themes, with some darker or more fantastical than others, but at the heart it always comes back to mystery and Dupin’s, or his bloodline’s, search for truth. The ones that really stuck with me are probably “The Sons of Tammany,” which takes Dupin to New York; “The Weight of a Dead Man,” which follows the grandson of Dupin, a Pinkerton detective trying to track down a Caravaggio; and “The Purloined Face,” possibly my favorite, where Sherlock Holmes is the apprentice to Edgar Allen Poe posing as Dupin. Connecting Holmes to Dupin was brilliant and it illustrated the similarities between the two while suggesting that Holmes learned it all from the best. But what I loved most about it was having Poe become Dupin after faking his own death and the exploration of the demons that Poe carried from his past. Of course, each of the other stories is captivating in its own right. Each one has something that will keep you reading until the very end. There are a few that get a bit outlandish (the Necronomicon does become involved in one and that made my eyes roll), but none of them are all-out bad or poorly written. Edgar Allen Poe fans will no doubt enjoy seeing one of his most famous characters given new life and the respect he deserves for founding many of the tropes of the detective genre. Mystery fans will love following Dupin’s deductions and trying to guess ahead of him. If you like a bit of horror, there’s plenty of that too. Beyond Rue Morgue is an excellent collection for anyone who loves a bit of mystery in life. And occasional apes.